Fact: Diabetes is an endocrine disease and is basically caused by deficiency or function of insulin which is produced by the beta cells of the pancreas. Type1 diabetes is caused by genetics and unknown factors that trigger the onset of the disease; while Type 2 diabetes is hereditary (runs in families) and also caused by unhealthy lifestyle. Diabetes is not a contagious disease. Fact: Diabetes is a very serious disease and is one of the leading causes of mortality world over. Diabetes leads to disabling and crippling complications. Two out of three people with diabetes die from heart disease or stroke. Fact: The answer is not so simple. Type1 diabetes is caused by genetics and unknown factors that trigger the onset of the disease; type 2 diabetes is hereditary and also caused by unhealthy lifestyle. Sugar does not directly cause diabetes but definitely adds to total calories and can lead to overweight which is a risk factor for diabetes. Myth: If you are overweight, you will eventually develop type 2 diabetes. Fact: Being overweight is a risk factor for developing this disease, but other risk factors such as family history, ethnicity and age also play a role. Unfortunately, too many people disregard the other risk factors for diabetes and think that weight is the only risk factor for type 2 diabetes. Many overweight people never develop type2 diabetes, and lots of people with type2 diabetes have normal weight or are only moderately overweight. Myth: Diabetics need a Special diabetic diet. Fact: There is nothing called as a diabetic diet. A healthy meal plan for diabetics is same as a healthy diet for normal healthy people with some restrictions and limitations i.e. low in fat (especially saturated and trans fat), moderate in salt, with meals based on whole grain foods (but low in refined carbohydrates), vegetables and fruits. So called "Diabetic foods" (Diabetic flour, drinks or biscuits) which are commercially available, are expensive and offer no special benefit. Myth: Diabetics should eat only small amounts of starchy foods (such as bread, potatoes and pasta). Fact: Starchy foods are part of a healthy meal plan. What is important is the portion size. Whole grain breads, cereals, pasta, rice and starchy vegetables like potatoes, yams, peas and corn can be included in your meals and snacks. For most people with diabetes, having 3-4 servings of carbohydrate-containing foods per meal is normal. Whole grain starchy foods are also a good source of fiber, which helps in keeping your gut healthy. You should avoid refined carbohydrates like maida etc. Myth: People with diabetes are more likely to get cold (flu) and other illnesses. Fact: No. Diabetics are no more likely to get a cold or another illness. However, people with diabetes are advised to get influenza vaccine, as flu in diabetics can have serious complications especially pneumonia. Myth: Fruit is a healthy food and you can eat any amount. Fact: Yes. Fruit is a healthy food. It contains fiber and lots of vitamins and minerals, but fruits also contain carbohydrates (fructose) and can raise your blood sugar. A diabetic patient can have approx. 200-300 gms. of non-ripe or 75-100 gms. of ripe fruit a day. Although all fruits can be taken, it is always advisable to avoid very sweet fruits e.g. Mango, Grapes, Cheekoo and Banana. Myth: Diabetics can never eat sweets. Fact: Diabetes can eat a certain amount of sugary food as part of a balanced diet, but they need to control the total amount of carbohydrates they eat. As sweets have no nutritional value except calories, so they should be limited. Myth: Children can outgrow diabetes. Fact: Children do not outgrow diabetes. In type1 diabetes, the cells of the pancreas that produce insulin are destroyed. Once they're destroyed, they will never make insulin again. Kids with type 1 diabetes will always need to take insulin to survive. Although kids with type2 diabetes may see an improvement in their blood sugar levels after puberty or with lifestyle adjustments, they will probably always have a tendency toward having high blood sugar levels, especially if they are physically inactive or gain too much weight. Myth: High blood sugar levels are normal for some people and aren't a sign of diabetes. Fact: Certain conditions (like illness or stress) and certain medications (like steroids) temporarily can cause high blood sugar levels in people without diabetes. But high blood sugar levels are never normal. People who have higher than normal blood sugar levels or sugar in their urine should be checked for diabetes by a diabetologist. Myth: People with diabetes can feel whether their blood sugar levels are high or low. Fact: Although someone with diabetes may feel physical symptoms (such as extreme thirst, weakness, or fatigue) if blood sugar levels are high or low, the only way to know for sure is to do blood test. Myth: All people with diabetes need to take insulin. Fact: All people with type 1 diabetes have to take insulin injections because their pancreases don't make insulin anymore. Only some (but not all patients) with type 2 diabetes have to take insulin with or without pills to manage their blood sugar levels. Myth: Insulin can cure diabetes. 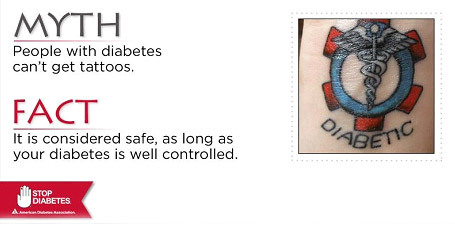 Fact: Diabetes is a non-curable disease. Insulin is a medicine that helps to keep the levels of blood sugar in normal range. It can not correct the underlying cause for diabetes, hence can not cure diabetes. Myth: Pills for diabetes are oral insulin. False: Pills for diabetes stimulate pancreas to release more insulin or improve the ability of the body to use insulin better. Pills are not oral insulin. Myth: Diabetics should not take insulin or pills during sickness. Fact: It is very important to keep taking insulin or pills even during illness. The dose may need to be adjusted during illness. Consult your diabetologist to know what to do during a sick day. Myth: Children with diabetes can't exercise. Fact: Exercise is important for all kids - with or without diabetes! Exercise offers many benefits to kids with diabetes. It helps them manage their weight and prevents them from gaining excess body fat. It also improves cardiovascular health, boosts mood, relieves stress and helps in blood sugar control. Discuss exercise guidelines and blood sugar management with your diabetologist. Myth: People with diabetes should avoid parties. Fact: There is no reason to avoid parties since everyone has right to relax and socialize. In fact, parties are a great way to relax and to avoid stress. You should try to have a balanced diet. Myth: Diabetes in women prevents them from having children. Fact: A woman with diabetes can have healthy children as long as she maintains normal blood sugar levels before conception and throughout the pregnancy. Myth: Diabetics can not do many jobs. Fact: Diabetics can do almost all jobs provided they control their blood sugar. Fact: The good news is that you can take small quantity of Dessert as long as you have healthy meal plan or combined with exercise. Myth: A high-protein diet is the best. Fact: Studies have shown that eating too much protein (especially animal protein) may actually cause insulin resistance and also can worsen kidney function. A healthy diet includes balanced proportion of protein, carbohydrates and fats. Our body needs all three to function normally. MYTH: You have to cut down Carbs. Fact: The key is to eat a balanced diet. The serving size and the type of carbohydrates you eat are especially important. Focus on whole grain carbs since they are a good source of fiber and they are digested slowly, keeping blood sugar levels more even.